Delta, United and American Airlines have banned the shipment of big-game trophies on flights after the illegal killing of Cecil the lion in Zimbabwe. The airlines announced that they would no longer transport lion, rhinoceros, leopard, elephant or buffalo remains. They have not, however, given official reasons for their announcements. 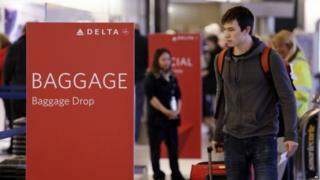 American Airlines and United fly to fewer sub-Saharan cities than Delta, but United said in a tweet its decision to stop carrying trophies was "effective immediately". United spokesman Charles Hobart said: "We felt it made sense to do so." Cecil was shot illegally in July by US dentist Walter Palmer of Minnesota. Zimbabwe is seeking his extradition and that of a doctor from Pennsylvania, named as Jan Casimir Seski, who is suspected of killing a lion in April. Mr Palmer is believed to have paid about $50,000 (£32,000) to hunt Cecil, a major tourist attraction in the Hwange National Park. Delta would not answer questions from journalists as to why it made its decision on Monday, nor would it detail how many hunting trophies it has transported in recent years. "Effective immediately, Delta will officially ban shipment of all lion, leopard, elephant, rhinoceros and buffalo trophies worldwide as freight," the company said in a brief statement. Its announcement came as several other airlines indicated that they are - or soon will be - stopping the transport of all trophy-hunting kills. How do you transport a lion's head around the world?